As I get older I’m learning to focus on the things in my life that are fulfilling, that make me a happier and more well rounded person. I’ve learned to say no to certain things and hell yes to others. It’s a daily practice of focusing on what actually brings me joy and eliminating what doesn’t. This shift has changed the way that I think about many things, but in particular it’s changed how I feel about the ways that I socialize and enjoy time with our friends. Over the past few weeks we’ve had the opportunity to spend a lot of time with some of our very best friends, just relaxing. We cooked and ate amazing food, talked and told stories and listened and laughed and enjoyed each other’s company in the comfort of our homes. It has been lovely. I count myself very lucky to have the friends that I have, from childhood, high school, college, our time in Baltimore, and now our friends in Wilmington. Spending the first two weeks of the new year with some of the most important people in my life has been a gift, and it’s given me a pretty good feeling of what this year could be. Before Christmas I made a few batches of candied meyer lemons, and I brought the meyer lemon infused syrup with us for cocktails. 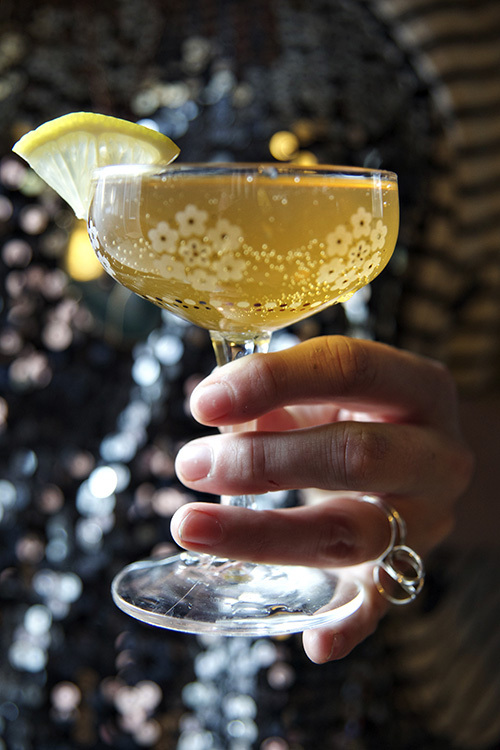 For New Year’s Eve we tried a spin on a French 75, mixing gin, syrup, and prosecco, which was delightful! 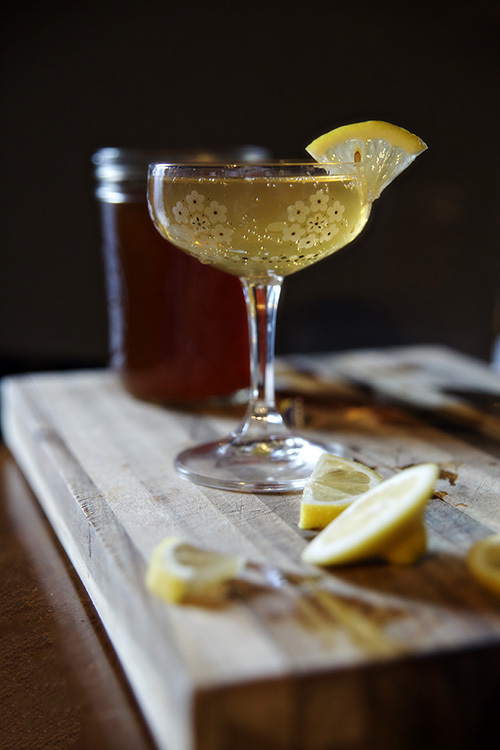 Meyer lemons have a lovely marmalade flavor that paired nicely with the gin and dry prosecco. I dubbed it the Meyer ’15- a cocktail that is the perfect balance of tartness, sweetness, and bubbles. A great way to start a new year! 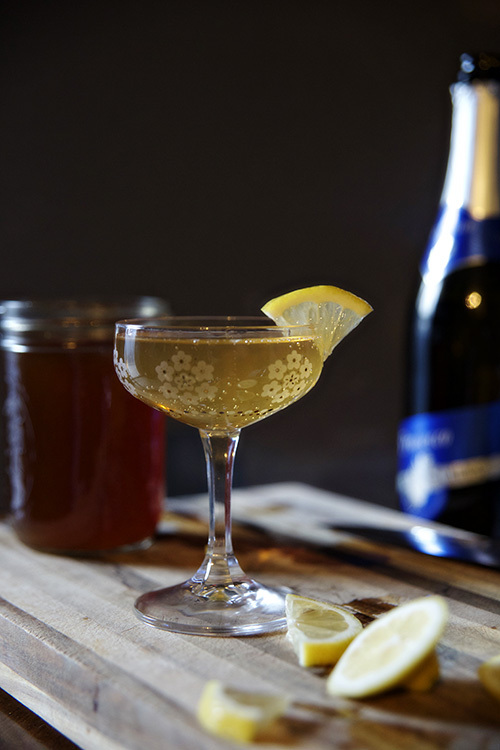 Fill each glass with 1 shot of gin and 1 shot of simple syrup, and top with prosecco. 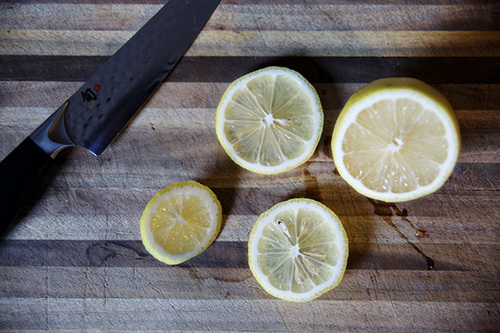 Give it a good stir and garnish with a lemon slice. Serve and enjoy! What a beautiful cocktail! Cheers to a fabulous ’15! I recently had one of these in a restaurant and loved it! Now I can use your recipe to make them at home. Cheer! Oh, I need to find some Myer lemons!!! I love your glasses!! 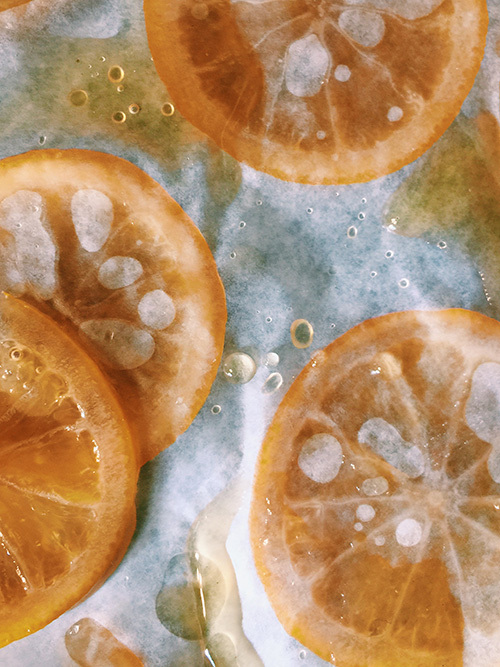 I (finally) saw my first bag of meyer lemons at the grocery store yesterday, and I talked myself out of them – I wish I hadn’t, because I’d be whipping up some syrup for these! They look so pretty and refreshing. Happy 2015! What an amazing cocktail and a lovely post to document it!